The fast-paced sing-song voice of the auctioneer… a scream… a cheer… and the winning bidder is announced. A lucky 4-H’er will go home with a dream horse, as another fine Arabian gelding is sold at a unique auction held at entertainer Kenny Rogers’ Beaver Dam Farms in Georgia. At the 1984 sale, only 4-H members had the privilege to bid. They had the opportunity to purchase animals at well below their real value, since all the horses offered for sale had been donated to the Georgia 4-H Foundation by Rogers and several other Arabian owners. Proceeds of the sale went directly to the Foundation. Arabian horses are important to Kenny and Marianne Rogers and so are young people. Its position as the largest youth organization in the state made 4-H the perfect means for channeling Rogers’ interest in providing opportunities for youngsters. “It’s our way of giving something back,” said Rogers. “We are glad we can support 4-H in this way. It is a worthwhile organization that deserves support.” The sale provided 4-H’ers an opportunity to buy horses at prices they could afford, and, for Rogers, it also was a way to encourage youngsters to develop an interest in the breed. There were 18 geldings for sale at the auction and more than a hundred young 4-H’ers bidding on the animals, and hundreds of others cheering them on, so competition was stiff. Based on the responses from the horse breeders, this first sale of its kind will probably not be the last in Georgia; and, perhaps some other states. 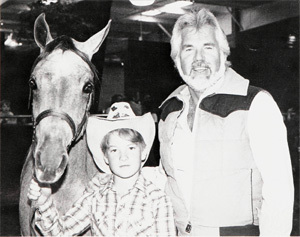 This entry was posted in History and tagged 4-HHistory, 4-HPromotion, KennyRogers by Larry Krug. Bookmark the permalink.